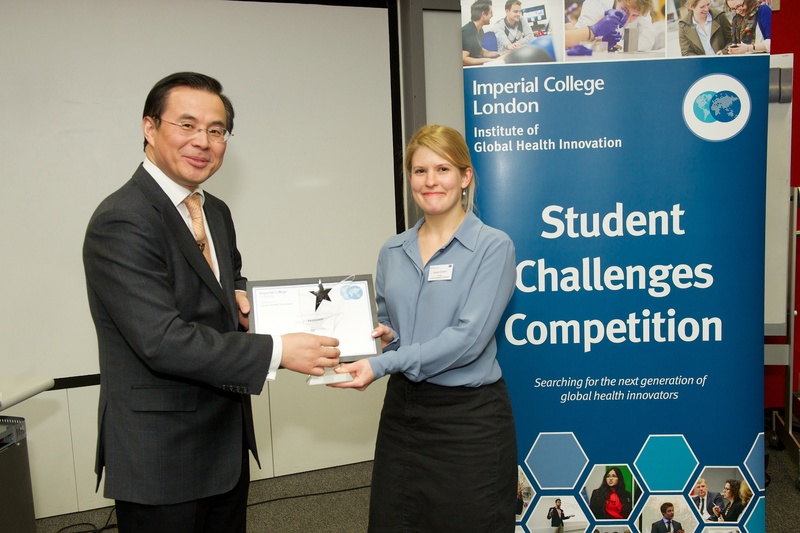 During March 2016, I blogged for IGHI on World TB Day about my experiences of entering the Student Challenges Competition. The intervening six months have been busier than I could have imagined, and filled with things like delivering an invited talk at the Biosensors Summit in Sweden, submitting my PhD thesis and completing an internship at the World Health Organization. Despite the chaos, I’ve managed to make some exciting advances with the nanomaterial-based diagnostic test for TB that I presented at the Student Challenges Competition. One component of this work has focused on validating the genetic markers that are the biological targets, or biomarkers, of the test. I have used various methods, some well established and others more experimental, to assess the reliability of the biomarkers in discriminating between patients with and without TB. As I said in March, this work is a real team effort and a large proportion of the analysis was conducted by Dr Myrsini Kaforou, who I’m very grateful to. The biomarkers validated extremely well across multiple platforms, which proves their robustness regardless of the HIV infection status of patients, and across geographical locations (Malawi and South Africa), showing that they’re robust and reproducible for use as diagnostic markers of TB. This work is currently being prepared for publication, so keep an eye out for it in the next few months! I have been keen to use mobile phone technology to translate the current assay, which currently requires a relatively sophisticated plate reader to record the results, into something more appropriate for use in field settings. Through the i-sense EPSRC Interdisciplinary Research Centre (IRC), my colleagues and I have been lucky enough to work with Dr Matthew Penny and Dr Steve Hilton from UCL, who have developed a working prototype of a mobile phone spectrometer that can sensitively detect the fluorescence of quantum dots (the nanoparticles I have been working with). The complementary metal–oxide semiconductor (CMOS) photosensor in smartphone cameras enables quantitative detection of relative red-green-blue (RGB) intensities. 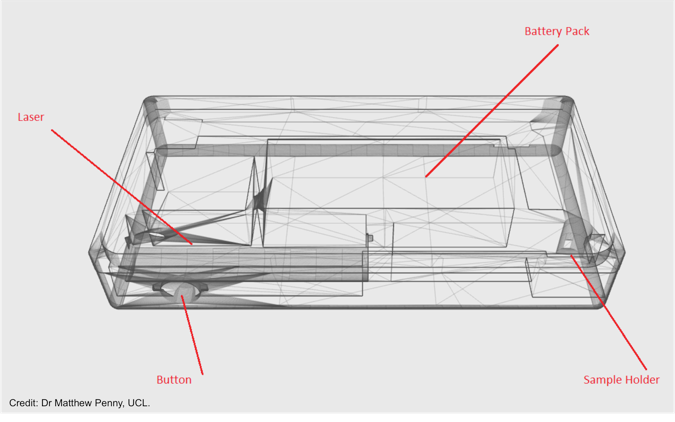 Dr Penny and Dr Hilton used 3D printing to construct the mobile phone spectrometer, as it allowed rapid prototyping and many iterations were able to be prepared quickly and at very little cost. The final cost for the spectrometer was kept to a minimum by using low-cost components, including the 3D printed housing (£0.80), an internalised laser (£2.50), battery pack (£0.84) and filters from a free swatch book! The overall cost of the first prototype was £4.14 and this could be significantly reduced by scale-up of the manufacturing process. This mobile phone-based spectrometer enables picomolar concentrations of quantum dots to be detected (~10 pM) and performs better (lower limit of detection) than many reported mobile phone spectrometers. I hope to continue working with Dr Hilton and Dr Penny, and possibly develop an app that could interpret the RGB intensity readout, while also integrating an option for the input of symptom information, in order to give more accurate diagnoses. My internship at WHO has focused on evaluating the diagnostic accuracy of dual HIV/syphilis raid diagnostic tests and has helped me further my knowledge of the regulatory, policy and implementation aspects of new diagnostic tests, which I’m sure will be very useful in the future. I’m extremely grateful to the many people who have helped me on this journey, particularly my supervisors Professor Michael Levin and Professor Molly Stevens, and also Dr Philip Howes and Dr Myrsini Kaforou. The i-sense EPSRC IRC has also been a wonderful platform for me to further my knowledge of diagnostic tests. I would also like to say a huge thank you to the IGHI for their support and encouragement with this work, and the wonderful opportunity that the Student Challenges Competition represents. 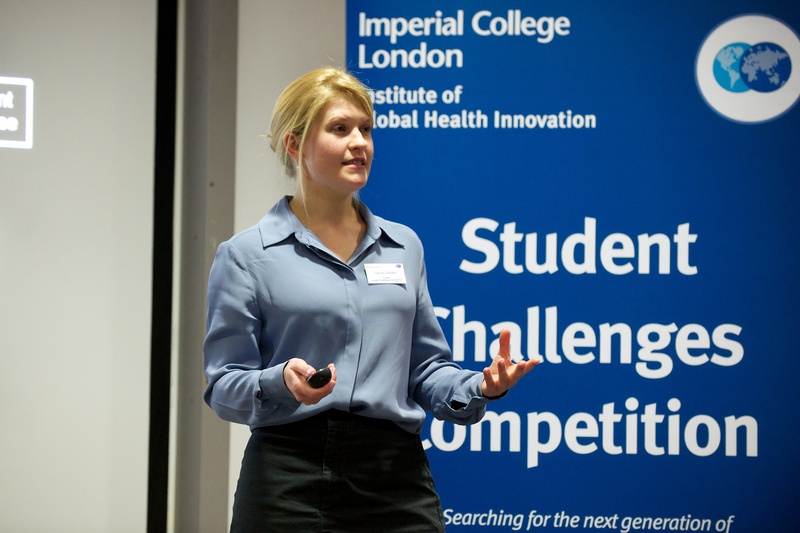 Student Challenges offers you the opportunity to showcase your research and to win prize money to fund your chosen project, which can be on any aspect of global health innovation. Each year, IGHI hosts a Dragon’s Den Style event to find the winner. The 2016-17 competition is now open for entries and closes at 11:59pm on Friday 28th January 2017. Find out more here and by watching the video below.